Publication of "SHIP" | SHIP HEALTHCARE HOLDINGS, INC.
A book about SHIP HEALTHCARE HOLDINGS, Inc. is now available. 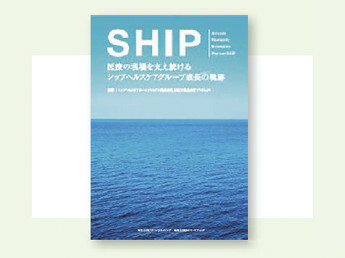 SHIP HEALTHCARE HOLDINGS, INC. have published a book, “SHIP: The Tracks of SHIP Healthcare group’s Growth, which Continues to Support Medical Sites,” through Nikkei BP Consulting, Inc. This book collects key information on the history of the SHIP Healthcare group to date. The Group is active in medical and healthcare area. This book also seeks to raise the profile of our company name, our group philosophy, and our personal principles, as captured in the acronym, SHIP. *Available only in Japanese edition. ©Copyright 2009-2019 SHIP HEALTHCARE HOLDINGS, INC. All rights reserved.